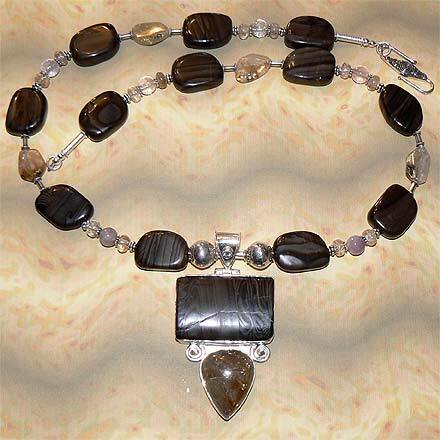 Sterling Silver Coffee Jasper, Rutilated Quartz and Amethyst Necklace. See Closeup. 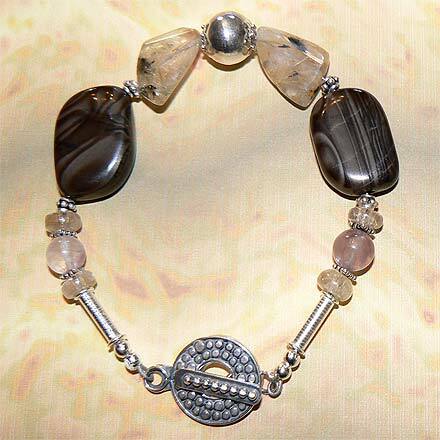 Sterling Silver Coffee Jasper, Rutilated Quartz and Amethyst Bracelet. 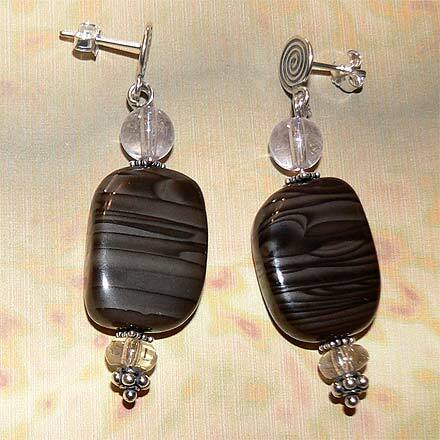 Sterling Silver Coffee Jasper, Rutilated Quartz and Amethyst Earrings. This is a very unique Jasper I came across. The bead store called it "Coffee Jasper" and it sort of looks like one took coffee, mixed in pearl powder, and then took chocolate syrup in a squeeze bottle and drizzled strands of syrup on top of it. 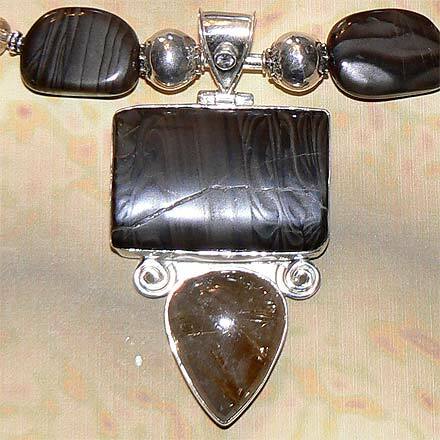 The Chocolate Jasper pendant bead has a unique crack-like streak or inclusion that goes across it horizontally looking like a lightning bolt. It makes for a nice composition, along with the gorgeous Rutilated Quartz and tiny little Amethyst on the bail. I used the most amazing Rutilated Quartz nugget beads too, with lots of inclusions. It's a longer necklace with large beads. For those who are interested in Astrological significances of stones, Jasper corresponds with Virgo and Leo, Quartz corresponds with Taurus and Gemini, and Amethyst corresponds with Pisces and the month of February.